Use our ready-made card, add your personal message on the front and the inside, then print your card, fold it and mail it off. This is how your 8 1/2" x 11" card will look when you print it out. Note that some of the text appears upside down, but once folded, it will look fine. 1. Download one of these Microsoft Word documents and Save to your computer. 371 kb. 2. Open the document and place your curser over the text and click to activate your text box. 3. Highlight the text and type your own words over it. Play with the font size, choose a different font, change the size or color using the commands on the top bar. Repeat in second text box. 4. Before printing; check it by clicking Print Preview located in the File menu in Word 2000-2004 or in Word 2007 find the Print Office Button then Print and then click Print Preview. 5. 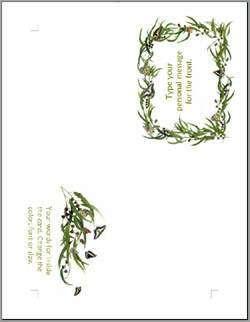 Print your card, then fold the paper in half, with the images on the outside, then fold in half again. Make your own cards. Find out how to put a border around text in Microsoft Word.